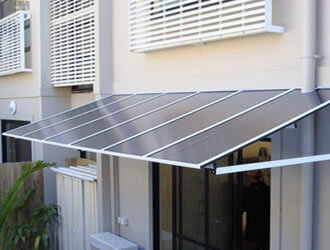 Carbolite awnings give you the protection, the looks and much more. Carbolite is 99.9% UV protective. UV Rays are the element behind the fading and rotting of your furniture and carpet. The protective coating extruded in Carbolite filters out these rays ensuring your furniture and carpet remain protected. Carbolite is ideally suited to applications where rain protection is required without reducing too much natural light. By filtering out much of the harmfull UV, only gentle natural light is transmitted. This product comes in a variety of shapes and sizes, from the traditional bullnosed to the architecturally domed and the contemporary flat, we are able to suit all applications. Carbolite is unique in its ability to remain a lightweight material yet be 200 times tougher than standard float glass. It is impervious to up to 25mm hail stones and has guarantees against cracking and rotting (conditions apply). The most common form is the flat awning. Simply attach the weather bar fixing channel and the awning clips into place. The system allows a waterproof channel to be siliconed at the wall to prevent any water leaking down the back. 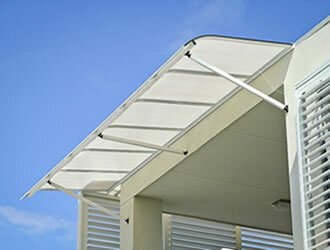 These awnings look great on contemporary buildings. They can be used to protect window and doors. The bullnose compliments most traditional Australian houses. The bull nose comes in a set 380mm radii, with both looks and head height restrictions to be taken into account. All sheets are heat formed and curved at CARBOLITE ensuring quality control. 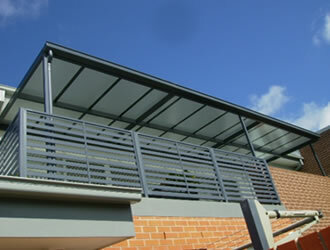 The awnings are easily installed on site. Gutters can be attached to the bullnose. They can be powder coated to most colours. 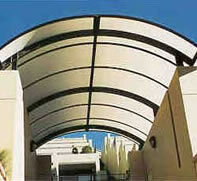 The Barrel Vault or domed awning is the architects choice. All sheets are cold formed on site to the radius specified. The aluminium H Bars which interlocks the sheet are curved to the designated radius. For larger jobs, curved steel understructure is necessary for supporting the sheeting. Gutters are placed on both sides and connected to existing drainage outlets. The front and rear openings can be in filled with polycarbonate or other decorative options. 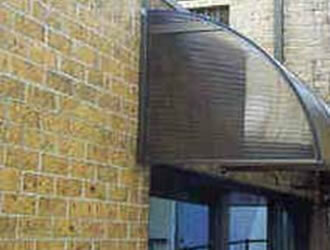 The 1/2 round is traditionally a fabric style awning to suit cafes and outdoor entertaining areas. Curved to a 1400mm radius, the half round can be installed on site at any angle. Sides can be in filled or left open. The frames can be powder coated in most colours . 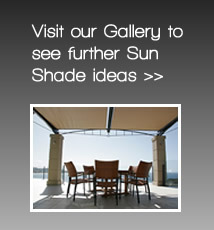 Flat patio covers are very popular as they have the clean straight lines of today’s modern architecture. Aluminium rhs box section is used throughout the frame for a neat rust free structure. The size of the box sections depends on the span of the patio cover. 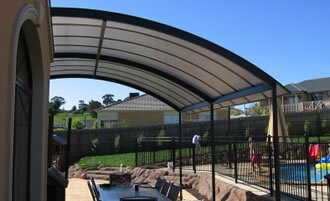 Bullnose Patio Covers give a traditional look and compliment traditional style houses. 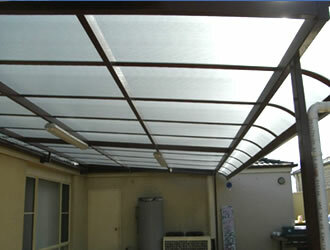 The polycarbonate sheet is heat formed in the factory and curved to the radius. All frames for our systems are engineered designed and approved to meet the most stringent standards. They comply with AS wind load standards.